It’s Lent now, so I think of everything in that context. Here in the Northern Hemisphere, at least some of us have Spring during Lent, so I want to note that in pictures. 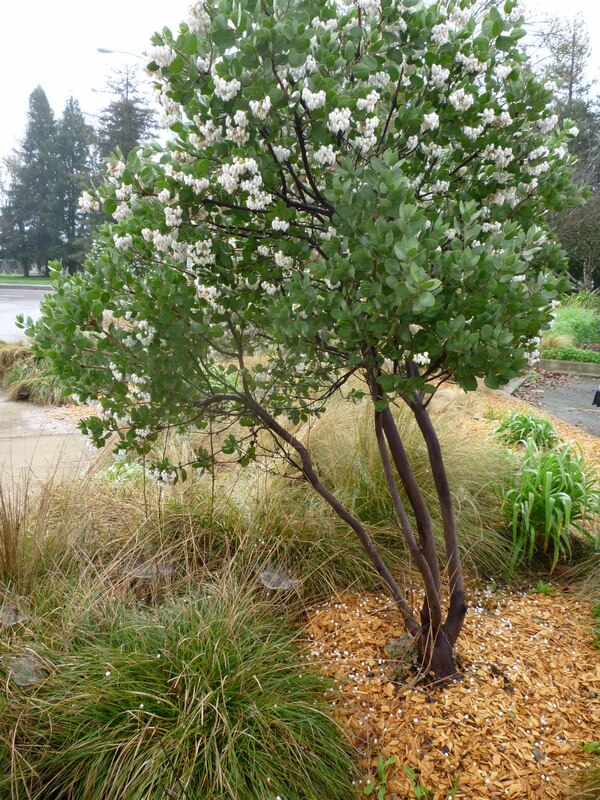 What got me going was the graceful manzanita trees at the library yesterday. Theirs have white blossoms. When I came home, I wanted to take a picture of our backyard bush in pink. The photo shows the ubiquitous weeds and fallen pine needles that tell of my absence. That’s the snowball bush in the background; it hasn’t budded out yet. 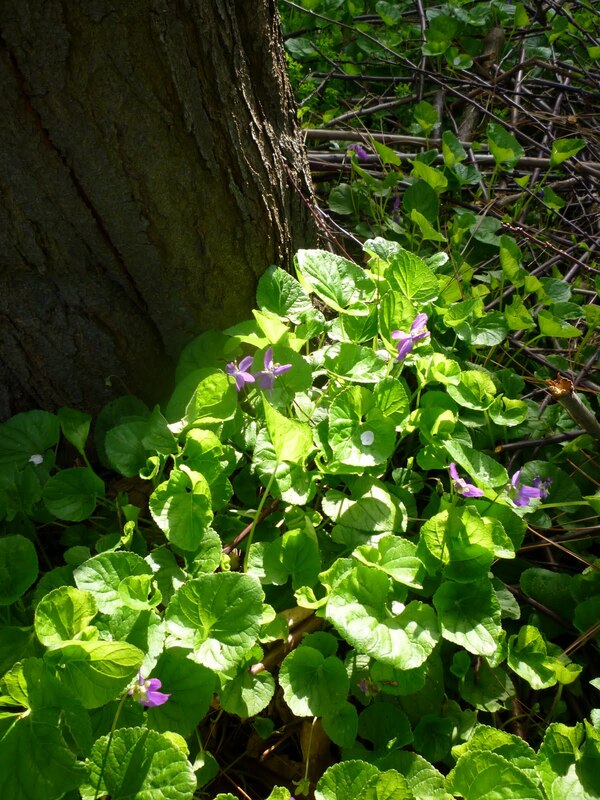 After chilly weather, rain, and a bad cough kept me from even venturing into the garden for several weeks, suddenly one day the sun was shining and I was taking pictures of all the blossoms, the cherry plum tree and violets, too. 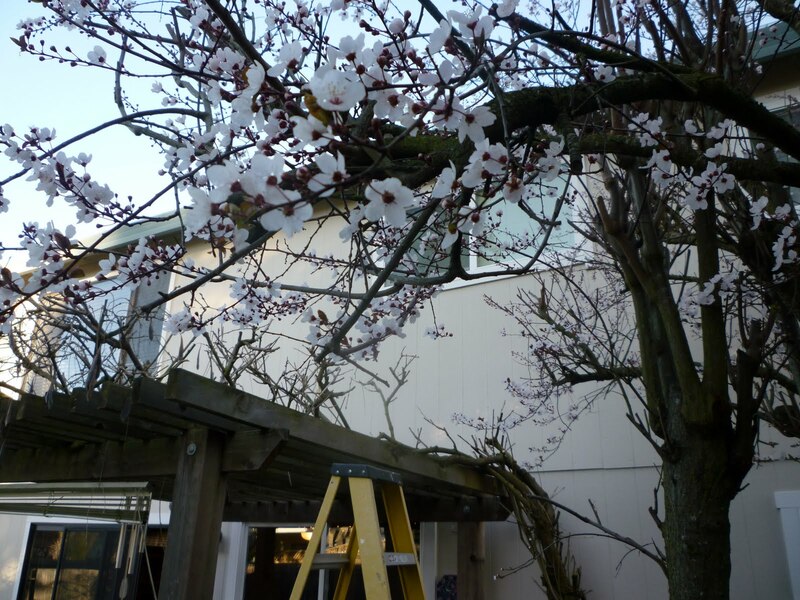 B. had been up the ladder pruning the wisteria on the arbor. Many years I completely miss the violets, their visit is so brief. Now, about Lent….I have to say I’m off to a disappointing start on several fronts. From one perspective, Lent seems long. That is, if one is thinking only of struggling and feeling defeated. Lent feels short, when I think how slow I am to get with the program of fattening my soul instead of my body. I will almost surely miss this brief opportunity, or at least, fail to make good use of it. I must try not to fret; but how to keep my trying from turning into more fretting…? I know that my Heavenly Father clothes the lilies of the field, just as He will give me this day my daily bread, Himself my Bread of Life. Now if I will just pay attention and eat from the loaf that tastes good, and nourishes the soul. Others of us do in theory but are still waiting. Yesterday's snow remains on the ground and now I loook with some degree of gentle envy at your beautiful photographs. Still, the cat seems unperturbed. Yes, I, too, have had a few false starts. I think that in some ways I'm only just beginning to understand what Lent is about – I don't mean an academic understanding of its history and dveelopment, but rather its actual meaning, purpose, and effect. Your words help. I loved reading this, you have such of way of speaking from your soul and spirit. I love the disciplines of a spiritual life in the belief that the word discipline is rooted from disciple, and that is what I am, a disciple of Jesus Christ. I am trying not to grumble about Lent, to be joyful. Maybe if I can learn to pay attention, I'll stop grumbling. I just learned last night that Isaiah is one of 3 books read in its entirety during Lent (Genesis and Proverbs are the others). So it is fitting that Isaiah 55:2 popped into your head. This from Met. Kallistos is very encouraging to me “Repentance is not self-flagellation; it is an opening flower.” I have always thought of repentance as self-flagellation. My prayers for you this Lenten season! 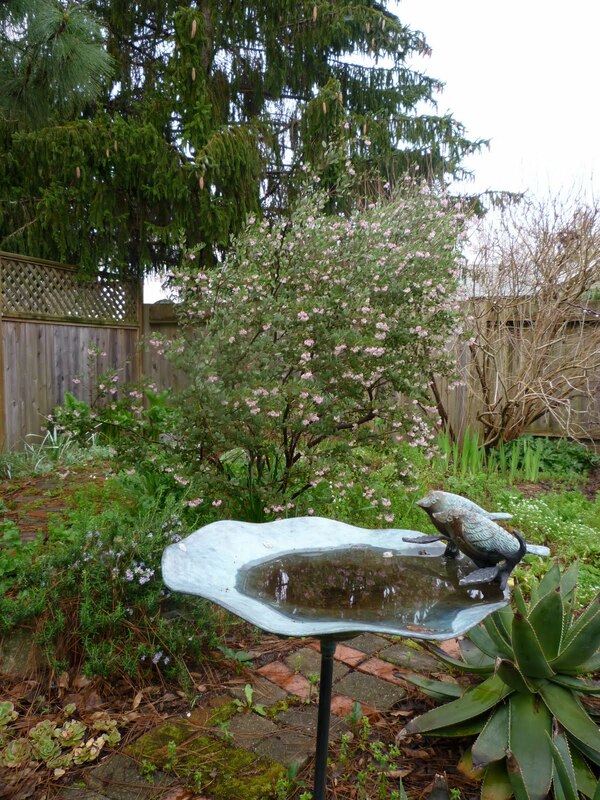 Beautiful post…both thoughts and pictures. Thank you. enjoyed this post as well!! Your title reminds me of a book by Fr Thomas Hopko that I hope to read one day… called Lenten Spring. Your post reminds me of the poem she wrote. This is just one stanza. Love your spiritual thoughts about Lent. Taste and see that the Lord is good. Yes! Beautiful post, Gretchen Joanna. I need to remember that the work of Lent is for my soul. I'm behind in reading your blog. For some reason my RSS feeder waited until today to dump several of yours posts into the queue. Elizabeth, I was given The Lenten Spring as a present a couple of years ago. It truly is worth the read. Michael, did I already tell you that I want to comment on your blog?–but I can't unless you change the comments format to pop-up. I guess it's some glitch in my computer, but it happens across the board. If you don't want to change it, please know that I enjoy reading. Oh dear! No, I didn't know, Gretchen Joanna. I'm sorry. Thank you for pointing it out as it may have affected other people. I have changed it now and yes, you're very welcome to my little blog.